Some people seem to have been born knowing just what they want to be when they grow up. David Robinson isn’t one of them. The possibility of a career in professional basketball didn’t even occur to Robinson until he was nearly through the Naval Academy. It’s hard to believe that Robinson—one of the 50 greatest NBA players ever—never played on a school basketball team until his senior year in high school. Unlike many of his peers in the NBA, he didn’t spend countless hours of his childhood playing pick-up games at the playground or signing autographs for imaginary fans. The thoughts of being a basketball superstar never entered his mind. Perhaps he was too busy. In elementary school David was enrolled in programs for the gifted. He not only excelled in academics, but he also proved to have a musician’s ear. He learned to play classical piano, as well as jazz saxophone. In junior high, he was taking college computer classes. While he was still a teenager, he built his own big-screen TV from a kit. It’s not that he wasn’t athletic. He was a natural. Baseball was his favorite, and he played almost every other sport, too. Every sport but basketball. 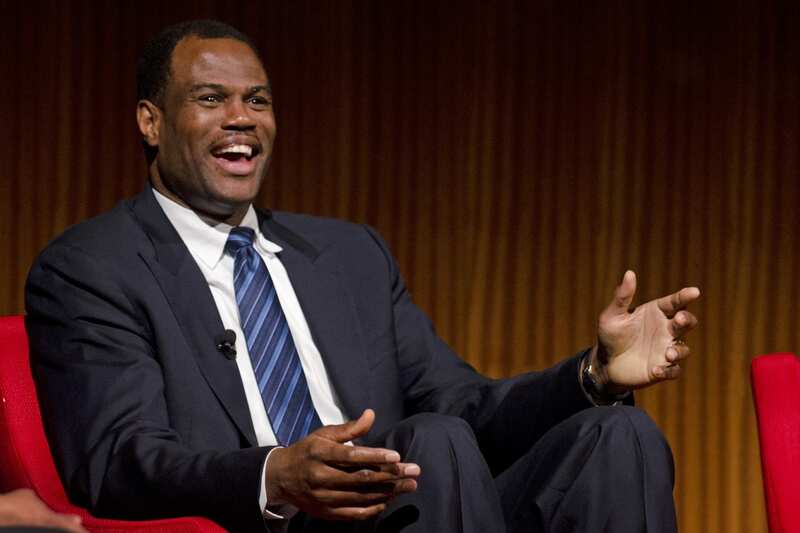 David Robinson had so many possibilities to choose from, so many talents to explore. Once he finally started playing hoops, his interest in the game grew gradually. When he first took the court of his high school in Manassas, Virginia, he played well enough for a newcomer to the sport—but he wasn’t anything spectacular. Neither was his freshman year at Navy. Uncomfortable on the court, he didn’t seem cut out for basketball. He averaged 7 points and 4 rebounds a game in his first year as a Midshipman. Then he started to grow. Seven inches in four years. Which made him 7’1″. Amazingly, he lost none of his coordination or agility as he grew taller; instead, he learned to use his height to his advantage. And he quickly grew comfortable on the court. By the time he graduated (with a B.A. in mathematics), Robinson was widely recognized as the best college player in the nation, and the San Antonio Spurs drafted him with the first pick of the 1987 NBA Draft. But he was a young man of principle, and he insisted on completing his two-year service commitment to the Navy before testing the waters of the NBA. Just as it took years for David to realize he was meant to play basketball, it would also take him years to realize that fulfillment isn’t found in athletic success. He made this discovery through a series of experiences—all of which pointed him in the same direction. In 1986, while in college, Robinson represented the United States in the World Basketball Championships, which the US team won. Flying home from Europe, he had a lot on his mind. He asked David if he would like to receive Jesus as his Savior. It was several years later that David discovered what it was. 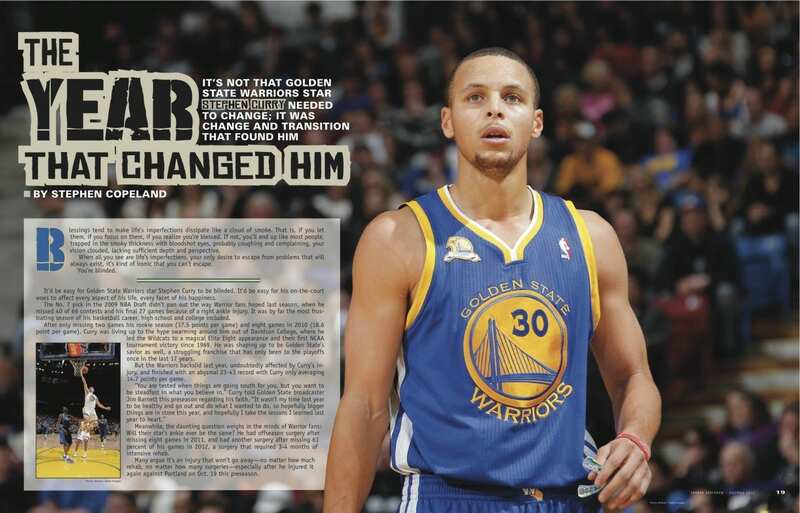 By that time, he had made it big—he was a member of basketball’s elite. Robinson had represented the United States in the Olympics in 1988, and then started his pro career by being named Rookie of the Month every month for the entire 1989-90 season—which made him the unanimous choice for Rookie of the Year. He played in the All-Star Game, and won the NBA rebounding title. As one of the highest paid players in the NBA, he had everything money could buy—luxury homes, classic automobiles—he was living a dream life. Yet he still felt an emptiness inside that nothing would fill. Then in 1991 a pastor visited David in the Spurs’ locker room. He told David he wanted to talk to him about Jesus. “I had some questions. I knew I needed to find out more about this Christian stuff,” David recalls. He agreed to meet with him. But when they got together, it was the pastor who had some tough questions for David. “Well, not often,” David admitted. David had to confess he didn’t pray very much. “Man, I don’t think I’ve ever done that!” said David. It’s been eight years since Robinson began seriously studying the Bible, seriously living what he said he believed. He’s come a long way in his journey of faith. That journey has led Robinson to be one of the most respected Christian athletes. His name is mentioned in the same sentence with Reggie White and Michael Chang when people talk about well-known Christians in athletics. But for Robinson, that’s not enough. He feels he still has a long way to go. There’s always something more to learn. That can be a challenge for anyone, but especially for someone who faces the distractions and temptations of life as a professional athlete. David receives a lot of love and support from his wife Valerie. And he makes a point of attending church as often as he can. It’s a part of keeping his focus. David also draws strength from his relationship with other Christians on his team, especially Avery Johnson. David says correction is a necessary part of growth—another step in the process—but it isn’t always easy to take. Robinson talks a lot about being broken, about being humbled. He sees himself as a work in progress. “I’m learning about preparation and patience, going through trials and developing character,” he says. Lately, Robinson’s been reading the book of Exodus and looking at the life of Moses. He notes that in his prime, Moses had wealth and privilege and power—and an awful lot of pride. Moses tried to deliver Israel from slavery on his own, but his efforts were a miserable failure. It wasn’t until he’d spent 40 years in the wilderness learning to rely completely on God that he became a man that God could use. David sees some parallels in his own life. For Moses, it took 40 years. For David, it’ll undoubtedly take a lot less time. But whatever the future holds, this big man is growing to be the man God wants him to be. 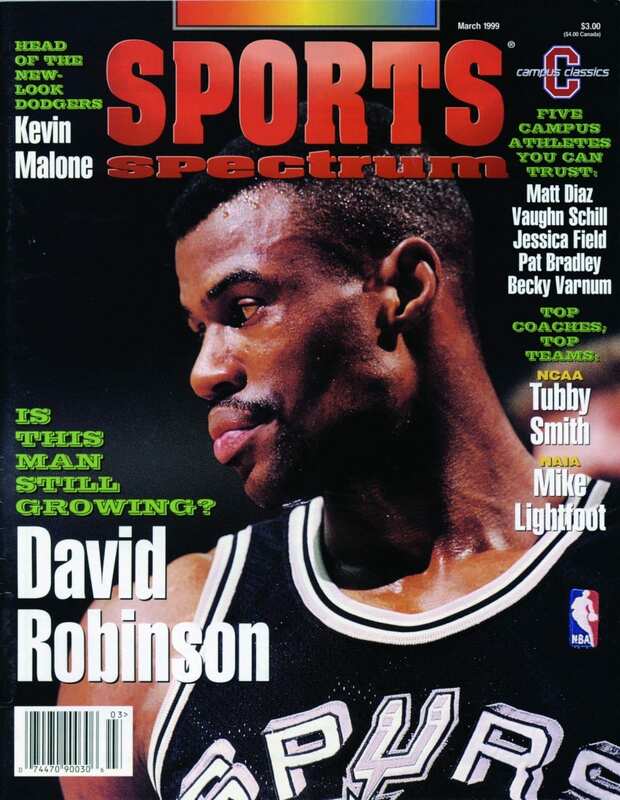 David Robinson was featured in several Sports Spectrum issues. This particular story is from March of 1999 when he was feature on the cover. 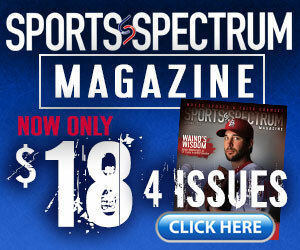 To order this issue from our vault, call 704-821-2971. There are only a few remaining!